Schedule time with teachers. Keep an open dialog with school staff to help your children thrive. Get your shots. Some schools require immunization records for entry. Find out if your child needs any vaccines before school starts. Ease into the school routine. A good night sleep is key to a successful school day. Preschoolers need 11-12 hours of sleep a night, school-age children need at least 10 hours, while teens need 9-10 hours. Pack a healthy and safe lunch. Choose a balanced meal for your children’s lunchbox and make sure you keep hot foods hot and cold foods cold. Low-income families may qualify for free and reduced price school meals. Shop smart. Some states have sales tax holidays in August (not Illinois). Make a list, know what you need, and shop the sales. Knowing where the bargains are will help you save. Talk to your kids about online safety. Identity theft, bullying or inappropriate behavior can happen online. Teach your children about online safety as use social media to connect with old and new friends at school. Plan and practice how to get to school. 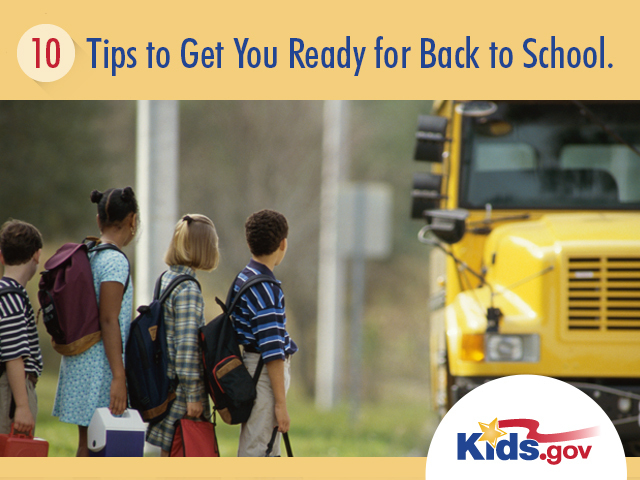 If your kids’ school or school system provides bus transportation, find the nearest stop to your home and the pick-up and drop-off times. Teach your kids to be safe whether by car, bus, bicycle, or walking. Teach time management. Leisure time, sports, and “screen time” can interfere with homework. Keep your family’s schedule on time with these tips. Make sure kids are insured. Your child could qualify for free or low-cost insurance through Medicaid or the Children’s Health Insurance Program (CHIP). Listen to your kids. Anxiety and nerves can take over, so provide a safe environment at home and in the classroom. Talk to kids about bullying and what to do if they encounter it. Check Kids.gov throughout the year for free educational and timely information for teachers, parents and kids. They are also on Pinterest! Check out their Back To School Pinterest Board.